All transactions are safe and secure with a reliable history in online purchasing behind each of our associates. 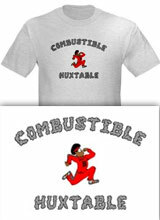 Buy the Combustible Huxtable t-shirt to own Cosby Show clothing and merchandise. When it comes to track and field, there was no one quite like Cliff who earned himself the nickname Combustible Huxtable. Although he still believes he's in shape, he couldn't be more wrong. When he decides to compete with Sanford Tailwind Turner, he discovers just how rusty he is. If you enjoyed watching him struggle to the finish line, grab some of The Cosby Show shirts like this Combustible Huxtable t-shirt featuring Cliff in a track uniform complete with an 'H' for Hillman on the front. Be careful not to let others like Tailwind Turner run away with them first. In addition to the Combustible Huxtable tee above, browse the Cosby Show Clothing Gallery for more apparel like men's and women's clothes, kids shirts or hoodies.